GE’s Series Compensation System allows utilities to cost effectively increase power transfer capabilities of their existing infrastructure and new transmission lines. Series compensation systems are installed in series with the High Voltage transmission line, and consist of an integrated, custom-designed system with many power capacitors arranged in series and parallel. The most critical equipment is the parallel protective system that prevents damage to the capacitors during power system faults. 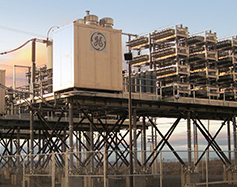 GE also offers an extensive portfolio of project management and engineering services, physical equipment and installation services, which results in an integrated and robust system for customers. Today’s transmission system is becoming increasingly complex and is expected to carry bulk power in ways it was never designed for. The expectation is that transmission requirements will only increase, as power generation sources continue to evolve. GE’s Series Compensation System allows utilities to cost effectively increase the power transfer capabilities of their existing infrastructure and new transmission lines, leveraging GE’s capabilities as outlined below. A worldwide leader in executing and delivering series compensation projects, in a broad range of utility environments resulting in reduced implementation risk. Providing superior systems enabled by GE’s innovate products resulting in project cost savings and increased quality and reliability. Industry leading and well-established set of project management processes and procedures, certified to ISO® 9001 standards, resulting in on-time and on-budget execution. GE’s Series Compensation System is comprised with industry leading and patented technology, helping customers achieve high reliability and lowest possible losses on their transmission lines. The major components of the Series Compensation System include Capacitors, Metal Oxide Varistors, Triggered Air Gap, and Fast By-Pass Switches. The capacitors are placed in series on a transmission circuit intended to reduce the overall line impedance and offers improved load division on parallel circuits, system transient and steady state system stability and allows for increased power transfer capability. A MACTAG is often used as an intermediate bypass device and is faster than the bypass switch, but not instantaneous like the Metal Oxide Varistor (MOV). GE’s patented design uses plasma injection to establish an arc which bypasses the capacitors and MOV until the bypass switch can close. GE’s MACTAG is the fastest in the industry (< 0.3 ms) as it does not rely on ground-based controls to initiate a bypass. A MACTAG lowers MOV cost by reducing the required MOV energy absorption. MOV are the primary device that protects the capacitors from overvoltage by diverting fault current. The MOV are semiconductors that conduct above a specific voltage, known as the Protective Level Voltage. The MOV limits the voltage across the capacitor bank to a safe value for the capacitors handling very high current for short periods of time and protect the capacitors until another bypass path is established. The Fast By-Pass Switch closes rapidly to limit both MOV and TAG energy, removing the series capacitors from service. This switch is also used for normal switching to insert the series capacitors or bypass them. GE’s Series Compensation offerings include three capacitor options: fuseless, internally fused or externally fused. GE works with customers to evaluate their requirements and determine the best technical solution to meet customer needs to ensure, reliable and cost effective system. GE recommends the fuseless option, which has been the dominant technology since the late 1990’s and is proven with a long term field failure rate of less than 0.03% per year. The film foil capacitor is a proven GE design that has been in use since the 1970s. The fuseless design produces the highest unbalance current (easy to detect a failed roll) with the lowest voltage stress on the remaining units (lower chance for a cascading failure). The diagram below depicts the two capacitor groups. 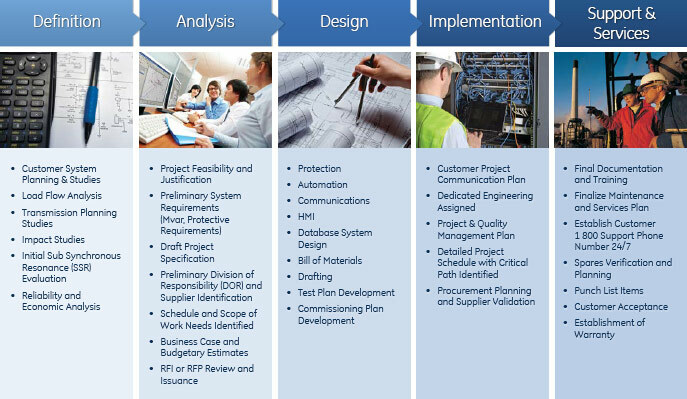 The GE project team represents unsurpassed worldwide power system engineering capabilities, comprehensive system design expertise, and unequalled project management experience. Our strength in each of these areas enables us to deliver a highly reliable solution that will fully meet your power system requirements. With each reactive compensation project GE undertakes, this team is committed to delivering 100% satisfaction. GE’s Series Compensation Systems brings together an extensive portfolio of products, services and engineering excellence to deliver the next generation systems for customers based on specific requirements to address both technical and business objectives as well as support several applications. 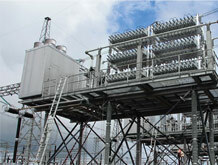 GE provides highly reliable and efficient designs that have low overall maintenance and cost of ownership. 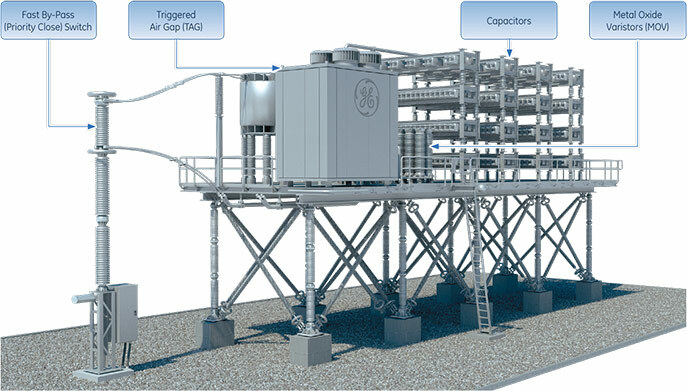 Below are just a few of GE’s selection of customer applications. Maintain voltage stability and efficient operations of the Texas Transmission System under minimum and maximum export of wind power. 50% compensation on 2 transmission lines from Tule Canyon to Tesla required series compensation to reduce the inductive line impedance compiled due to long line length. Ability to maximize amount of wind power to be transferred across the new 345 kV transmission lines. Improve capacity of the 500 kV Vietnam transmission system with a compressed amount of time of less than 12 months to install systems. 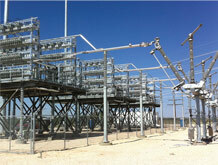 Increase in the power transfer capability of existing transmission lines. Increased reliability of existing transmission systems, improved voltage support and amount of power transfer capability and timely delivery of equipment meeting compact schedule requirements. Edison, Gauss, Kirschoff, and Orsted Substations. Need to provide reliable and efficient power across the new 345-kV transmission lines required to maximize the transfer of renewable generation. Must not negatively interact with the existing generation or system – Sub Synchronous Resonance concerns. Eight series compensation banks located at four different sites to enable the maximum amount of power transfer capability on new 345-kV transmission lines in the CREZ regions throughout Texas. Reliable and efficient means to transfer power from renewable generation on the new 345-kV transmission lines in the CREZ areas. 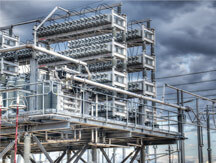 Need to provide reliable and efficient power across the 500 kV California-Oregon Intertie . Required to increase the overall power transfer capability across the tie to facilitate the increase in capacity requirements from renewable generation projects being added to the regional system. 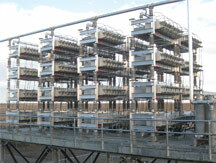 To enable the maximum amount of power transfer capability on the California-Oregon 500 kV transmission intertie. Reliable and efficient means to transfer power from renewable generation on the new 500 kV transmission California-Oregon Intertie. GE supported a staged fault test performed by BPA, which demonstrated the capability of the GE Series Capacitor banks to withstand a close-in fault with no damage. 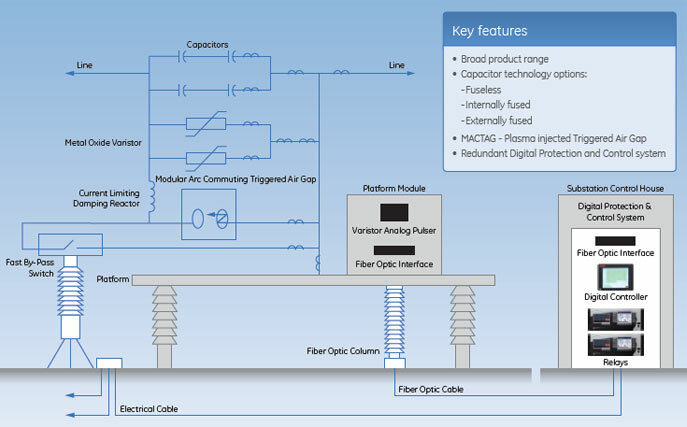 GE’s family of Modular Arc Commutating Triggered Air Gap (MACTAG) solutions represent the industries leading technology for fast protective devices. The patented technology provides fast, reliable bypass protection, which can reduce the amount of Metal Oxide Varistors (MOV) required on a series capacitor bank resulting in project cost savings.